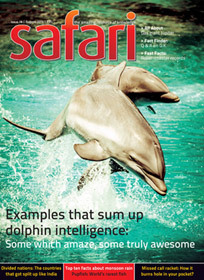 The cover page of Safari – a science and knowledge magazine from India – August 2013 issue, gives a look of a nature oriented magazine! The inside cover page has a fascinating high resolution picture of Bill-clattering White Stork. August is the month of festivals in India. This month this time contains the major festivals like Raksha Bandhan and Janmashtami. There is one more important festival approaching this month; the Independence Day of India. It was after many sacrifices by true patriots, so many fighting strategies and numerous war the country got the Independence from the British rule. So an article about the same is expected in Safari – and it doesn’t disappoint us. There is a 3 and a half page article by Harshal Pushkarna titled The rise, decline and downfall of the British Empire. The Independence of United Indian was resulted into partition and as a result India and Pakistan (and Bangladesh later) were separated. It is the beginning of British empire in Asia and Africa. And we all know the size and economy shrunk again to very limited area nowadays. Read some interesting analysis of this period, in this article. Hummingbird, considered as the smallest one, lives a very active life. Actually the sound of its helicopter like activities (humming) is responsible to give it the same name. An article by B. M. Purohit which spread over 4 pages, is the themed article of this issue and the cover page image reflects the same. The article is an attempt to bring some interesting facts of a hummingbird’s life to the readers. Do you know that, every night, when the hummingbird go for a sleep, it is not known to anyone (including itself) that whether it will awake the next morning!!! Read more about it inside the article, you will surely like it. An interesting collection of facts! Harshal Pushkarna brings us another article. It is about the spherical stones found in the Central American country- Costa Rica. The stones are considered as an archeological mystery. Since 1930, there are around 300 stones are found which are perfectly sphere! Who and when created them?! No one knows the answer! It is a good read for the people who love archeology and geography. It is the monsoon running all over India now a days. And this time it is comparatively heavy rain which even prove a disaster in several areas. The fast facts segment brings summarized information about the unbreakable record of rain-making. An on time article. Do you know that Howrah Bridge is the busiest cantilever bridge constructed in the World? Commissioned in 1943 is one of the oldest bridges in India. It is also known as “Rabindra Setu”. Nearly 1,50,000 pedestrian and 1,00,00 vehicles uses this bridge! And yes, who can forget a film by the name was made a long ago! There is an article focused on “how it was constructed?”, which is a worth read. Amongst all species of spiders in the World, which is the most venomous? What advantage do tubeless tyres have over the conventional tyres? A massive star, having exploded as supernova and blown off its outer layers, becomes a black hoe, What happens to the black hole at the end. What causes hemophilia in which blood continues to ooze out from a wound or even the slightest cut without stopping, and the injured person eventually bleeds to death? Why it is called the royal disease? Why does United States unyieldingly stick to the imperial system of measurement where as the rest of the World has gone metric? There have been reports that every few years new islands are formed, only to submerge soon after. Have there been such instances recently? To save energy, is it possible to illuminate cities at night with space-based mirrors that would beam reflected sunlight to them? What it is in Einstein’s theory of relativity that rules out travel faster than the speed of light? The Super Quiz section of this issue is focused on – Amazing rivers of the World. The last cover page brings the history of the Indian Tricolour (the National Flag of the Republic Of India). And yes there are a few gags to enjoy as well. Overall a nice reading. Nowadays it is rare to find such genuine magazines which presents knowledge and information in reader-friendly manner. Our personal suggestion – one should go for it.